You know how sometimes you get it into your head that you'll do "just one quick project" before a major holiday, because you want the house to look nice and you think an arbitrary deadline will help you get it done? I did that. With my foyer. Now, honestly, it was easy to make the mental leap here. I don't have any grand entrance, no two-story lofted ceiling, no chandelier, no staircase. My foyer is barely 4 feet by 5.5 feet, and a small closet is exactly opposite the front door. On either side it opens into the living room, or into our front room (the office). This is no place for square-dancing. Just like people are glib about bathrooms, I was glib about this foyer. That was two weekends ago. And I'm not even technically "done," I just completed a list of short-term goals. 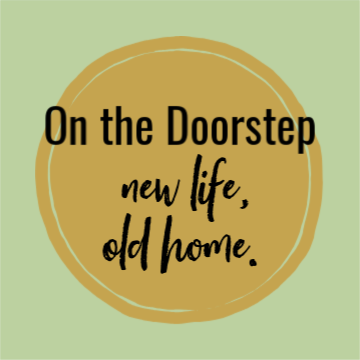 The woodwork and doors were tired and scuffed, the paint was fleshy beige on both the walls and the trim, and there were even faint drippy stains leftover from a catastrophic coffee travel mug bomb that got dropped on the floor last winter. The whole thing was getting me down. I didn't even take before pictures. So just imagine something in your mind of that sort of tired, scuffed and grubby state that highly trafficked areas get, and sigh heavily. I did. I decided that the color going on my front door outside could come inside, too. I like how it's setting off all the apple greens and browns in my living room. It's a Valspar paint color called Cinnamon Cake, but done in Sherwin Williams exterior grade satin gloss. It's a bit more subdued and spicy looking in person than is showing in the photo. The paint on the walls is Valspar's Oatbran, which is a beige that is taupey-gray enough to avoid any pinkish overtones. Super important when you're going with an orange door. You can also see my vintage foyer light, original to the house, in the upper corner of the photo. You know what also revamps a foyer? Cleaning about 18 billion dead gnats out of the light shade. Who knew? 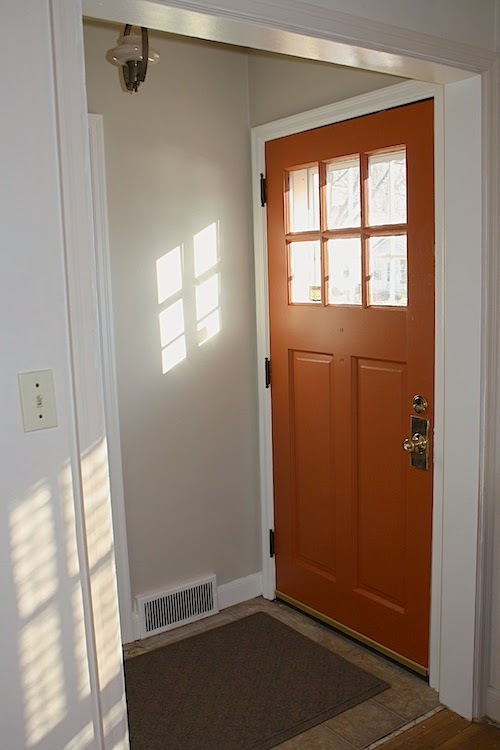 After having the paint and woodwork painted the exact same color (and a color I didn't like) it's been a pleasure to see the contrast of freshly painted white woodwork with the burnt orange and oatbran colors. 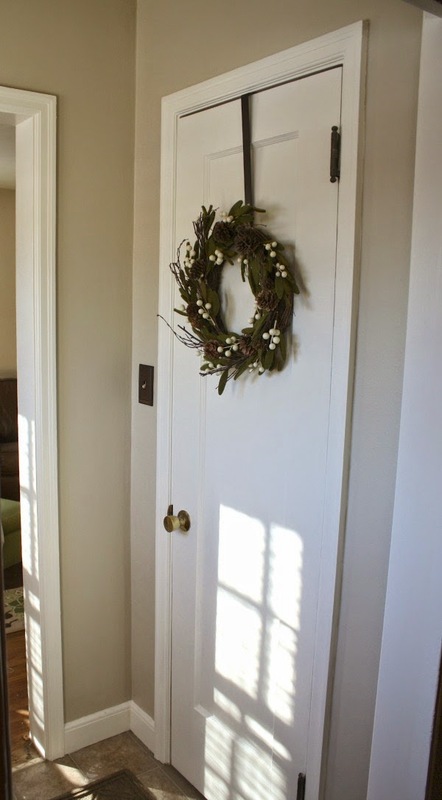 And I hung a wreath from Target on the door. Just a wee tiny bit of early holiday decorating. I'm usually pretty strict about that sort of thing, but this seemed more "winter" than "Christmas" to me. It doesn't solve all the obvious problems in this tiny room. The hardware on both doors needs either refinishing (closet door) or replacing (front door). The torn vinyl is still there, though it's under a new and bigger (though still not big enough) rug. I'm glad I decided to go bold with the front door, instead of just going with white. I find myself sitting on my sofa with my mug of coffee, staring at my pumpkin pie door. It's just the right color for entertaining guests over Thanksgiving, and they'll be here soon--my sister and her family. They'll be just in time for my other company's-coming crazy-in-the-head behavior, which is trying a recipe I've never tried before. When will I learn? Probably never. But in the meantime, here's to fresh paint on the walls!